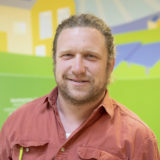 Chris has been working in the solar industry for four years, installing PV and thermal systems around the state. After studying at Norwich university he gained a well rounded design education in the architecture and construction fields. Originally from Northern Virginia, Chris now lives in Montpelier. He enjoys spending time with his daughters, playing sports – rugby in particular, and being outdoors.